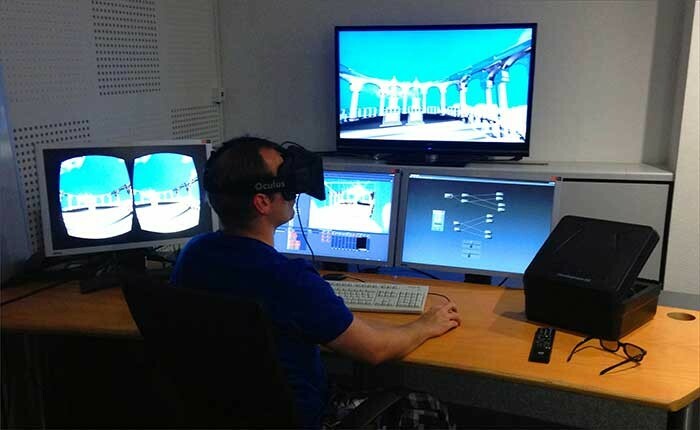 coolux GmbH, creators of the multi-award winning Pandoras Box product family, have successfully completed a series of tests revolving around the revolutionary new Oculus Rift HMD (Head-Mounted-Display). The Oculus Rift HMD can be easily connected to the Pandoras Box media server range. A direct input node, which is part of the recently be released coolux Widget Designer Version 4.5, makes it easy to implement the new display technology in a wide variety of setups. The ability to experience virtual worlds this way could be an important tool for innovative trade fair presentations, visitor centres, museums or simulation scenarios. What is special about the Oculus Rift HMD (which as of yet is only available as an SDK version) is its very fast sensor, which can display head movements as rotation axes (Yaw Pitch Roll). This sensor makes it possible to immerse oneself in virtual 3-D worlds in real-time. The HMD is set to be available for a substantially lower price than any comparable solutions that have been available up until now. Although the current SDK’s resolution can still be improved upon, the consumer version is expected to feature an HD display. The combination of coolux Pandoras Box systems and the Oculus Rift make it possible to vividly show how a single person is experiencing virtual spaces. With Pandoras Box one can even integrate passive or active 3D monitors to let whole groups of people truly see what the person wearing the Oculus is seeing. Due to the Pandoras Box support of advanced 3D tracking systems like OptiTrack, the immersive Oculus experience can be extended even further to offer full body tracking. coolux GmbH is excited to implement these new technologies as part of the creative toolkit that can now be employed for bringing real-time interactivity to a new level. coolux founder and CEO Jan Huewel further explains his reasons for deciding to integrate the ingenious Oculus Rift at such an early stage: "We at coolux want to give our customers the greatest creative freedom possible, especially when it comes to integrating new technologies into the Pandoras Box workflow. Our passion for innovation is the key driving force in everything we do. As soon as I had heard about the Oculus Rift, I instantly wanted to test it. The interaction between the HMD and our realtime-compositing and show control environment will definitely lead to exciting projects. We owe it to our customers to not just follow trends after they’ve become commonplace, but to actively create ways in which they can realise unforgettable moments in new and exciting ways."